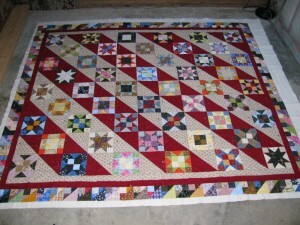 Posted on November 14, 2012 by Julie / This entry was posted in Quilting. Bookmark the permalink. Most people love quilts. I mean, who wouldn’t? They are bright and beautiful and warm and make us think of our ancestors. After all, quilts and quilting have been around for hundreds of years. Anyone who knows someone who makes quilts is apt to say at some point in the relationship, “You should make me a quilt.” The statement is made as if you could step into your sewing room in the morning and pop out in the afternoon with a ready made full size quilt in your hand. Oh, if it were only that easy. Let’s look at what is involved in making a quilt. The very first thing to decide is the pattern or design to use for the quilt. Until you know this, you do not know the next step which is what fabric to use. The two go hand-in-hand. Choosing the pattern takes a little bit of time. You browse through books and magazines, or search the web looking at quilting images of quilting patterns. If you find a quilt pattern you like, you are done. Sometimes, you find a block design you like and want to create your own pattern based upon that block. Then you have to do a lot of calculations based upon the desired finished size. What is the total number of blocks needed? Will they be sashed or unsashed? How wide is the sashing? Will the quilt have a border or two borders? If a border is wanted, how wide should the border be. All of these questions come into play when selecting a quilt design. Once you have decided on design, then you can start deciding on fabric colors and patterns (the design on the fabric – calico, large floral, geometric, solids, batiks, etc.). Sometimes, this is an easy process as you may decide to go with the fabric colors and patterns of the quilt pattern you have selected. Other times, you may want to make your own selection of fabric colors and patterns. How do you choose colors and patterns of fabric? Sometimes, ideas come readily. Other times, you are looking at your own stash and finding the colors and/or patterns you want (but not having enough material to use for the quilt) or again, looking at finished quilts and noting the choices others have made. Then again, you may go to a fabric store and browse the aisles of fabrics, selecting from what is available and what looks good together. The next step after you have decided on the pattern and the fabric colors and patterns is purchasing the fabric. It would be nice to be able to go down to the local fabric store and walk in, select the bolts that match your fabric choices, have them cut the fabric and head back home to begin your quilt. This is seldom the case. Most of the time, you will find some or most of what you need at one store, but then you will have to go to one, two, or several more to find the remaining pieces of fabric. Ordering online might be a little faster, but you can never be sure that the colors you see on screen will be the actual shades and tones of the fabric you receive. It is also difficult to judge from online samples exactly the size of the fabric pattern. Once you have purchased all of the fabric you need to make your quilt, you must wash and iron all that fabric (this is not absolutely necessary, but highly recommended). An hour in the washer, an hour in the dryer and an hour or two ironing and folding the fabric and then you are ready for the next step – cutting the fabric. 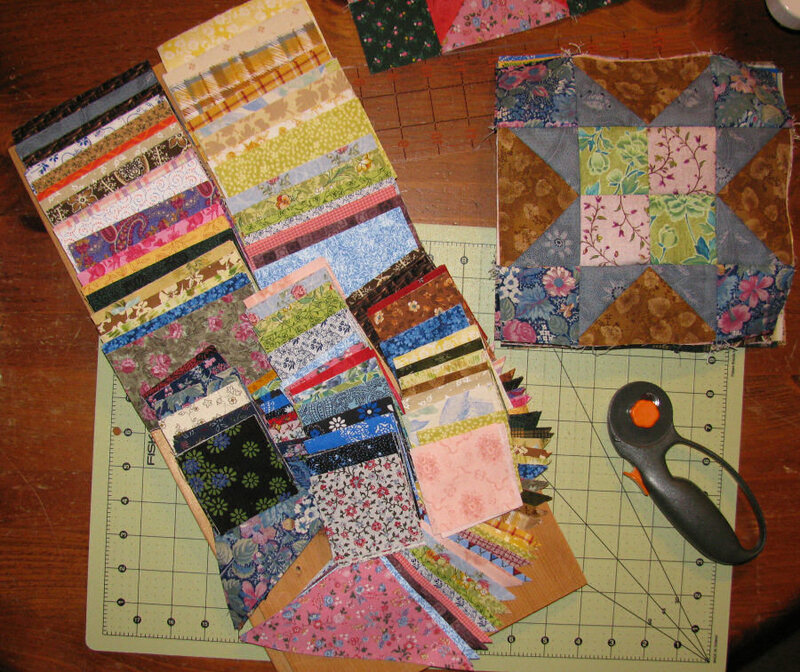 Cutting your fabric is a crucial step in making your quilt and takes considerable time. If this is a quilt or block pattern you have never made before, it is a good idea to make a test block or sample of the pattern out of fabric scraps. (I usually buy a little extra of the fabric for the quilt and use this to make my test block. 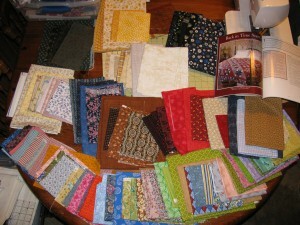 That way, I can determine that I have made good fabric choices for the quilt.) This not only builds your skill in making the block or pattern, it helps you understand the purpose of each cut of fabric. You have to be careful and very precise in cutting your fabric pieces. You want your blocks to be uniformly sized and your points and corners formed correctly. Cutting the fabric can take several hours to complete. Once you have all of the fabric cut, you organize your cut pieces and then begin sewing your blocks. You assemble, stitch and press your way to completing the total number of blocks or the pattern needed for your quilt top. Then you sew your blocks together into rows and then the rows are stitched together to form the quilt top. If you have chosen a quilt with sashing, once the blocks are completed, you have to stitch your sashing to the blocks and you have to stitch your sashing rows together, as well. Then you can sew all of the rows, block rows and sashing rows, together. If you have a border to add to your quilt top, then you sew the border pieces together and then stitch that to the quilt top. Was that one, two or three borders on that quilt? How long it takes to complete the top depends greatly upon the choice of pattern. It could take one day or many to complete the top. After the top is fully assembled, it needs to be pressed completely and thoroughly. This allows the quilt top to lay flatter and smoother as you work with it to finish off the quilt. After ironing, you must lay it out on a flat surface so that you can measure its width and length. Even though your pattern may give you a finished size for the top, you need to measure your actual top to be sure of the size before cutting your backing and batting. Now that the top is done, you can work on the back of the quilt. 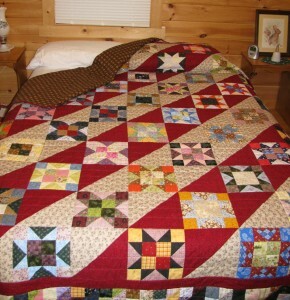 Since it is difficult to find material wide enough to cover a full size quilt’s width, it is likely that you will have to sew at least two sections together to make your quilt back wide. I am assuming here that you are using a “whole fabric” backing and not piecing a backing, which is another option, altogether. On a twin size quilt and some full sized, you will have one seam down the center back. A full/queen, queen and king will have two seams down the back. You will cut your purchased backing fabric in one or two sections each at the length of the quilt top plus 8 inches. Then you will sew these sections together. After stitching the back seams, you must press these seams open. So you spend an hour or so cutting, stitching and pressing the quilt back. Now you have the quilt top done, the backing assembled and you are ready to layer the quilt. You need to have your batting smooth, so hopefully, you took that out of the package the day before you needed it and spread it out somewhere to allow the wrinkles to work out of it. If not, you will either work harder at smoothing the layers, when it comes time, or you will throw it into the dryer for 15 minutes or so to heat it up and allow the wrinkles to release. 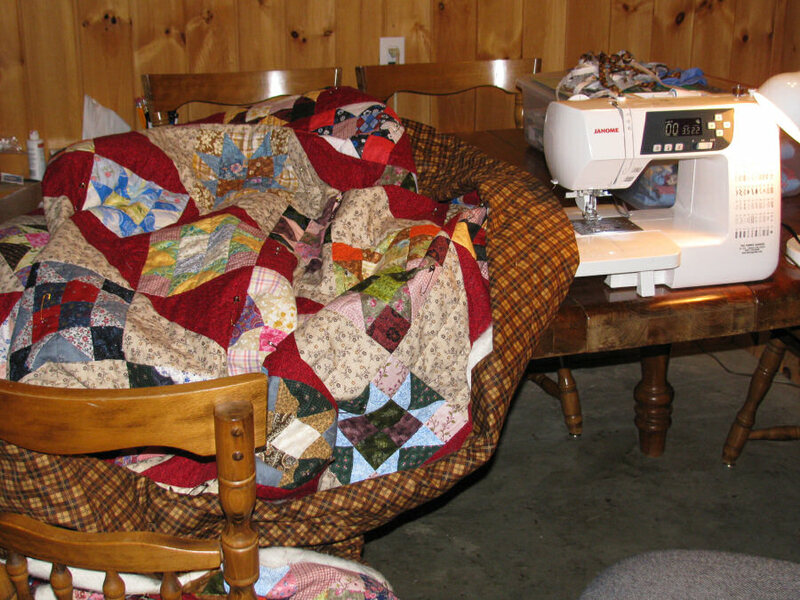 If you are like many people who quilt at home, you barely have enough room to lay the quilt layers (backing, batting, and quilt top) out on the floor, leaving just a few inches of narrow space around them. You spend the next hour or more on your knees smoothing the layers, tugging the edges, and making sure there are no bumps or ridges in any of the layers. Then you begin pinning the layers together to hold them in place while you quilt. You pin about 200 safety pins through the three layers of fabric working from the center out, continuing to smooth and still working on your knees (oh, those poor knees!). Finally, you have the quilt layers securely fastened and you can begin – QUILTING! Hah, you thought you had been quilting all along. In reality, you made a quilt top and you made a quilt sandwich (putting the three layers together). The actual quilting is when you stitch through the three layers, securing them permanently together. One more decision has to be made: How will you quilt this quilt? What quilting pattern will you use – stitch in the ditch, simple straight lines horizontally and vertically placed, free motion stippling, or some other, more complicated design? You make your decision and you spend the next few hours (or days, depending on the design selected) quilting your layers, taking frequent breaks because the quilt is heavy. The larger the quilt, the heavier it is, and the harder it is to handle and maneuver in your home sewing machine. You back aches, your arms get tired, your eyes go fuzzy while you work, but you quilt on until your whole quilt has been quilted. Ahhh, what a feeling – you now have a quilt! It isn’t finished, yet, but it is a quilt. Next step, trimming the edges all the way around to make your corners square and your sides and ends straight. Back to the floor the quilt goes again with you crawling all around it with your rotary cutter, a square, and a cutting mat trimming off the edges and squaring the corners. A half hour later, the last edge is trimmed and you marvel at the beauty before you and know you are only a short ways away from a beautiful, finished quilt. Before you relax, though, go find those measurements you had of the width and length of the quilt so you can calculate the length of the border you need to bind the quilt. A little more math, a little more cutting, and you have your binding strips ready to assemble. So, now you can stitch your binding pieces together end to end with 90 degree angle seams. Yes, more math and a constant up and down as you trim the ends at your cutting mat, stitch the ends together at your machine, then press the seams open at your ironing board. Seven to eight seams later, you have your border stitched together. Back to the ironing board you go to fold it in half lengthwise (wrong sides together), pressing it as you fold for the whole 300 to 450 inches. Another hour spent calculating, cutting, stitching and pressing the binding. You are so close, now, you can taste the victory. Ready to stitch the binding onto the quilt? But wait, you have to make a quick run around the edge of the quilt with the binding in hand, pinning it at the start and sliding your hands along to match binding and quilt edge to make sure no seam in the binding winds up at a corner on the quilt. If it does, you have to move your starting point and follow the binding along the quilt edge again, so you can be certain you will have no extra bulk on the corners of the quilt. Once done and you have your starting point, you can finally stitch your binding to the quilt edge. You have another hour invested. After the binding is stitched, you press your binding towards the back of the quilt all the way around and while you do this, decide to either hand stitch the binding to the back of the quilt or machine stitch it in the ditch. Hand stitching will take longer, at least an hour or more, but you won’t have any problems making sure you cover your seam when you fold the binding to the back of the quilt. Stitching it down with in-the-ditch stitching will work and probably take less than a half hour, but you will probably wind up picking out some stitches, restitching certain areas, and you will still have to hand tack the corners to make sure your miters stay secured as you machine stitch over them. Whichever method you choose, the binding will be secured to the back of the quilt. Once this is complete, your quilt is done. Step back and congratulate yourself. Now, how long did that take you? Let’s see, if it was a simple nine patch with no borders or sashing, a whole cloth back, quilted with simple free motion stippling over the entire quilt and you worked on it every day from the first decision made to the last stitch of the binding, you might be able to get it done in less than a week. If it is a complicated pattern like a feathered star or compass rose and you have odd sized blocks, sashing with cornerstones, multiple borders with a pieced back, quilted in an intricate quilting design and you worked on it every day, you would probably need up to four weeks to complete the quilt. Of course, these time estimates are assuming you have nothing else to do except quilt. No housework, no job, no kids, no pets, no husband, no phone, no life – just quilting. So, if you are considering purchasing a quilt and wonder at the price tag, know that a lot of time and effort went into the making of that quilt. If you have been fortunate enough to be the recipient of a handmade quilt, know that the individual who gave it to you must regard you hightly. Cherish it and use it and care for it as a lifelong friend. P.S. I only talked about time involved in making a quilt. I did not mention costs. Here is quick breakdown of conservative costs of material for a queen size quilt (90×95 inches) based on fabric costs of $5 per yard. Quilting fabric can run as high as $10-14 per yard, so the fabric costs would be double or more, in this case.